Persimmon Recipes, Wine, Patience, and History: How to Make it! Persimmons? You Need a Recipe for Persimmon Wine. Every year, the Persimmon Tree looks dead or dormant. If you blink, you'll miss the beautiful blooms.Bountiful, orange-salmon fruits appear beckoning, but don't take the bait too soon.The pucker power is shocking causing the mouth to pucker and the tongue to tingle. Looking for Persimmon Recipes? What can you do with Persimmons? Here are things to make at home with Persimmons. Enjoy! It is said that harvest can be made after the first frost. One might want to wait for a frost or two to allow the fruit to ripen to a passionate, purply-orange. Keep an eye on the fruit. Don't pick them all at once, just like people, persimmons mature at various ages. Harvesting the perfect persimmon is an art. Rotten persimmons are not pleasant. One year, I picked a cupful at a time and froze them until I had enough for a batch. A batch of what? That is the perplexing problem with persimmons. A lot goes a little way. Perhaps a simple pudding, chutney, or jam for one. Maybe you'd like a cobbler or a pie? The internet is abundant with recipes and instructions for picking and preparing the perfect persimmon. All Recipes has an amazing selection of persimmon recipes. My advice stir up a big helping of patience before starting. Removing the seed is a chore. Native Americans made many predictions based on the persimmon tree. Once you've removed a seed cut it open to predict the weather. If you see a fork inside expect a mild winter. When all is said an done expect to end up with a putrid appearing unpalatable mess. Now, you are ready to prepare a persimmon recipe. Click the link "The Patient Persimmon" above for everything you never wanted to know about Persimmons. This year, I am thinking of trying this recipe. At least after all of the work, I can relax with a nice glass of wine in a year or two. After the tedious collecting and preparing of 3 lbs. of persimmon pulp, it might take more than one glass of wine to restore sanity. 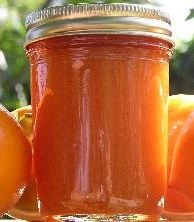 Make Persimmon Wine at home. Wash the persimmons, cut into quarters and mash the seeds out with your hands. Mash the pulp well, put into primary, and add half the sugar, the acid blend, yeast nutrient and crushed Campden tablet. Add water to total one gallon. Stir well to dissolve sugar, cover, and set aside. After 12 hours add pectic enzyme and recover. After another 12 hours, add yeast. Ferment 5-7 days, stirring daily. Strain through nylon sieve. Do not be concerned if a lot of fine pulp gets through; it will precipitate out. Add remaining sugar, stir very well, then transfer to secondary while leaving about three inches headroom. Fit air lock and set aside. Rack every 30 days until wine clears and no additional lees are laid down (4-6 months). Stabilize only if you feel the need to sweeten the wine before bottling. This wine should age in the bottle a year.